Kinley lost her tooth last week and since she’s only lost a few, we’re still considered “newbies” at the whole Tooth Fairy stuff. Back when I was younger, we would hide the tooth under our pillow at night and in the morning there would be a quarter. I was always so excited! (Inflation… I think I’m giving away my age here lol). Things have definitely changed since then! My parents never told me any specifics about what the tooth fairy looked like, so I always imagined a pretty little ballerina with wings who carried a big wand and sprinkled fairy dust everywhere. 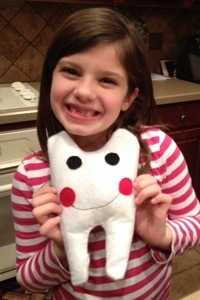 I also wondered what the tooth fairy did with all those teeth? It’s kind of gross if you think about it… Anyway, I digress. 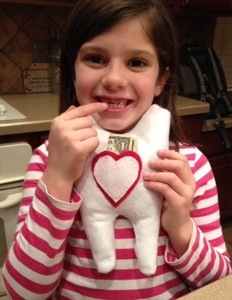 Do you have any cute Tooth Fairy traditions or stories?